Annually Maxim magazine has compiled a list of the of the sexiest girls in the world. This year, the list was topped by the model Hayley Baldwin (20), the niece of actor Alec Baldwin (59) ("Aviator", "Alice"). What do we know about Hailey? She is from a very famous family, the "Baldwin dynasty". In addition to Uncle Alec, Father of Hailey, Stephen (51), another Uncle Daniel (56) and a two-sided sister Ireland (21) are also engaged in the acting career. Last year the media blew up the news about the new girl of Justin Bieber (23). This was the lucky Hailey, and the whole world watched their affair, which lasted several months. True, many believed their relationship was a PR, but they looked like a very happy couple. The girl collaborates with several modeling agencies, was the face of Topshop, Tommy Hilfiger, Forever 21 and Guess. Hailey walked the runway at the Fashion Week in New York, and presented a new collection with Sisters Hadid at the Tommy Hilfiger show. By the way, Sister Hadid and Sister Jenner are Hailey's best friends. In an interview, Hailey has repeatedly admitted that she loves to dance and has been doing this since she was five. However, the video with her dancing girl often shares on her Instagram. After the eighth grade, Hailey switched to home schooling: it was hard to study at school because of too well-known relatives - the girl was tired of the constant questions about her family. Baldwin - a real fan of Leonardo DiCaprio (42). The star often uploads photos of Leo in social networks. By the way, he recently broke up with the model Nina Agdal (25), so that Hailey has a chance. 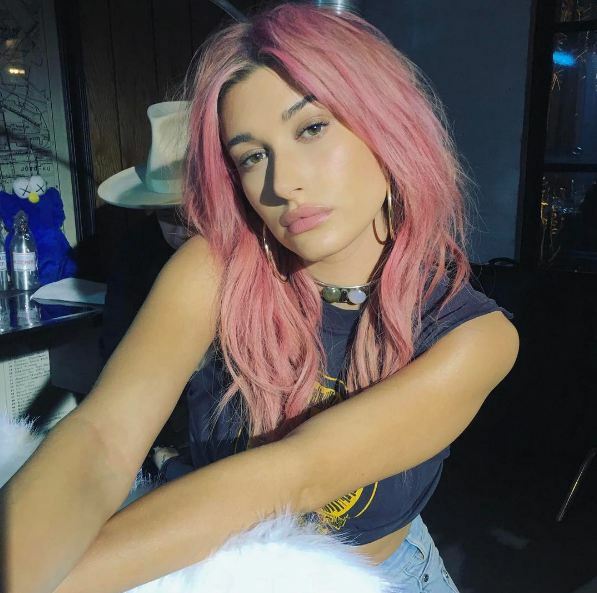 The real hair color of the sexiest girl in the world is dark-blond, but the model likes to experiment, she was both a brunette and a blonde and even dyed her hair pink. Hailey is a scorpion, which means she is quick-tempered and always achieves her own.